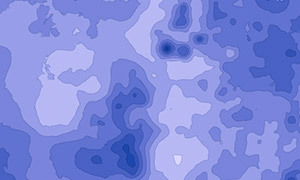 Intuitive colors in this map hint at the amount of cooling you would want in your home over the course of a year based on where you live. We love that you can click on any location to learn more about that area—an effect that pulls us into the map. This map is embedded in a rich thematic atlas about energy use and consumption that ties together heating and cooling needs with the sources and costs of energy. This map introduces us to “cooling degree days,” a way to determine how much you would need to cool your home in a typical year based on where you live. Smooth contours of the data show that cooling patterns are not related to more familiar political boundaries, such as state borders, but vary according to elevation, latitude, amount of sunshine, and other climate factors. 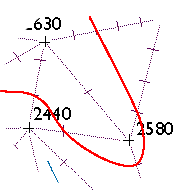 Working with ArcMap you need a sufficient number of point measurements to interpolate an isoline (aka contour) surface. The more complex the spatial pattern, the more points you need to create an accurate picture of the world. When you have complex topography, you need thousands of data points from across the country. Learn more about creating isoline maps here. Cooling degree days are based on the day’s average temperature, minus 65. They provide a rough estimate of how much air conditioning may be required over the course of a year. Data is ready to map. Just choose cartography that visually reflects the amount of cold air that needs to be generated to keep buildings comfortable in these areas. Because the data contours are pre-generated by NOAA and available for download, this map took less than one hour to import, style, and publish. 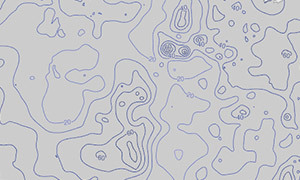 Typically when you interpolate contours from point data, you need to smooth the line work to reduce noise and artifacts of the interpolation process. Otherwise the map is harder to read and overall patterns can be obscured. 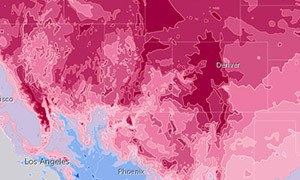 This dataset was computed using data from the National Climatic Data Center’s US National 1961-1990 Climate Normals (NOAA, 1994b). The original data is in whole degrees Fahrenheit. The data was downloaded from NOAA.